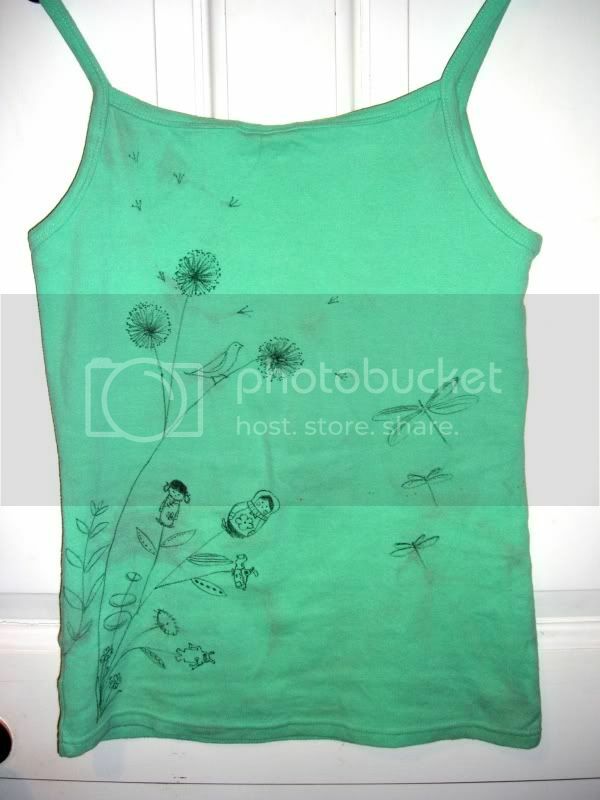 I decided to have fun with it: I bought a laundry marker and drew on the cami in hope of distracting people from the stains (in retrospect when I should have gone with a design that focuses more on the top part, which is stained more). I quite like how the drawing turned out, especially since I managed to weave in my fave things - dandelion, plants, matryoshka/kokeshi, molecules (yes the plant on the right sprouts caffeine molecules, among others). I wish the fabric marker is more 'black' though - not enough contast as it is. Do you think I should draw more stuff on the top part of the cami to distract from the stains there? Or should I just leave it as it is? Those aren't stains- they're tie-dye! 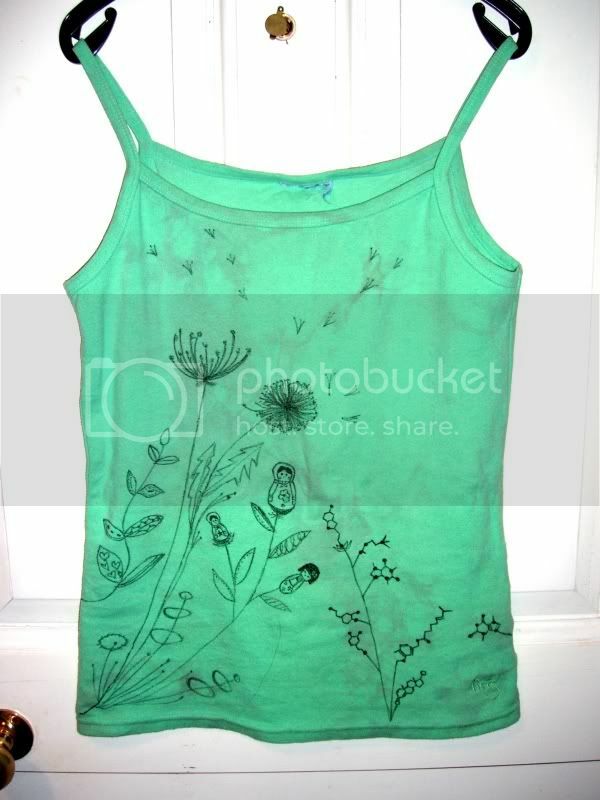 I looked at the pics before I read the post, and I thought you had just drawn on a tie-dyed cami! I love the dandelions. I agree with everyone else so far- keep it the way it is. What draws my eye is the artwork, and to put more I think would detract from the design. Someone would pay at least $20 for the exact same shirt if it were in Delias or something. I really like how you managed to salvage your poor, innocent cami. The drawing is topnotch. And it defiantly makes the stains look put there on purpose. When my father used to do my laundry, he somehow managed to do this all the time. Too bad I wasn't thinking with the craftster side of my brain, or I could've done this to those clothes. I wouldn't change a thing about it, it looks perfect. Ooo, that turned out lovely! You did a wonderful job saving that shirt! That's super cute! If you hadn't mentioned your tights running, I would have thought the fabric was meant to be like that. I also thought the "stains" were part of the fabric!! Your design just makes the whole cami look very artsy and unique--like you got it in an expensive boutique!! WOW! Nice safe!! I like it a lot! I love it. The background looks just like tie dye I swear. Excellent laundry job!